It’s been a long time coming. The U.S. will see its first station wagon from General Motors since the demise of the of the CTS wagon years ago in the form of a Buick Regal. And new spy shots show the Regal TourX wagon ahead of its debut. There’s no denying this is the Buick Regal TourX, despite full camouflage being applied. The front grille mimics the Opel Insignia Sports Tourer, but the badge fixed upon it is undeniable a Buick tri-shield. The camo also does its best to try and distort the final design, but we’re nearly certain the Regal TourX will be a carbon copy of the Insignia Sports Tourer when it does show face. Earlier this month, the California Air Resources Board confirmed the existence of the Regal TourX in a certificate for the vehicle’s powertrain. That report indicated a 2.0-liter turbocharged four-cylinder under the hood sending power to an all-wheel drive system. Though, we don’t know for certain how Buick will spec the TourX. We do know, however, that Buick plans to reveal the 2018 Regal on April 4, ahead of the 2017 New York International Auto Show. Whether the TourX is part of the day’s reveal remains to be seen, though. I love the “Opel Blade” from Monza. Adams did a truly outstanding job with this wagon–the sort off white space that Buick will never address again now that Opel is gone. Opel, Vauxhall, and Buick together sold 2.4 million units yearly and this does not include other Opel products sold as Chevrolet in many markets. Opel’s sale hasn’t helped stock price. It has only weakened Buick and GM. Within two years PSA will have Opel back in black and the automotive community will wonder why GM, with global reach, hadn’t done more. Refal TourX will sell more units than expected due to sharp design. Congratulations Opel for a job well done! Really hoping they offer the 3.6 V6 from Holden in the new Regal. It wouldn’t be a bad offering for the GS trim. something to consider is that while GM uses the 3.6 in a variety of products and it would be a power upgrade (by about 50 horsepower) there is no option for ordering it in the 2018 model. It is strictly the 2.0 turbo which produces about 252 horsepower. This is about the same horsepower as the old 3.6L that was in the last wagon in this segment: the Malibu Maxx (240 horsepower on the available 3.6). GM has been simplifying ordering options and trim levels by reducing the number of potential configurations. There is only one wheel option available for this vehicle across three trim levels. From what I can tell GM will wait to see how well the TourX sells on the 2018 model before they introduce the option for a more powerful engine. With that said there are rumors that the Impala line will be dropped as well as the Lacrosse platform. Both of those carry the 3.6L. If they stop production of those two vehicles after 2018 they will have an excess of 3.6’s that they will likely offer in various platforms as an option. I don’t know if Chevy will include it on the Malibu because it already has two engine options without including the Hybrid, but I suspect that the two regal models will get an engine option upgrade in 2019 if they cease production of either the Lacrosse or Impala. The TourX has a particularly heavy weight. With similar power output to the Audi A4 allroad but nearly 500lbs heavier (and nearly identical differences compared to the Subaru outback as well) it will be sluggish by comparisson. Compared to the VW Golftrack it will have 80 more horsepower but 800 more lbs of weight. The Style, technology features, and interior room of the TourX will come out ahead in all of these areas with equivalent options when matched for price compared to the competition. The performance will likely feel weaker than the Audi allroad or subaru outback, but the a 3.6L would make it competitive, but it may drive the price up which is why I suspect it will be a high trim level option. A high trim level 3.6 option also makes sense because Audi and Volvo will be the fastest feeling competition with the highest price tags. By relegating the 3.6 to high trim levels it can still stay competitive in both the standard and luxury wagon markets. I believe that with the first year introduction GM was smart to offer more room at the expense of weight relative to performance if it meant keeping costs down and gaining market share in this small but growing segment. I just know they will put ugly plastic body cladding and Jack the suspension up. At that point it will look less like a sleek European wagon and more like a Subaru Outback. I want a real wagon, GM! Beautiful, I don’t think GM really understands just how ready a market this car has for it. Had they built the same Chevy Cruz in the same “Estate” model as is sold in the UK an Europe the market would have welcomed it. I also don’t believe that outside the “soccer mom” class just how tired the market place is of “just another suv” … a suv that dern near little sport amd even less utility. I really like the Chevy Trax, and would trade for one if it could tow about 1,500 pounds. But, the Trax an it’s Buick cousin aren’t meant to be used towing anything period. Again, some sport … no utility. Looks like they didn’t show it today? I was one of the first to Commit to Purchase the new Buick Regal wagon…I loved the look, and the overall dimensions being the same as our previous Mercedes E-Class wagons, and it’s German build quality. Sadly, I am seeing the old GM tactics that pushed me away from past purchases, of GM product. I will happily keep my commitment to Puchase the Regal that was shown in the previous images…the classy, upscale, sleek in appearance Buick caliber wagon, without the plastic cladding that is reminiscent of the old Volvo wagon, and the Fake off road stance. 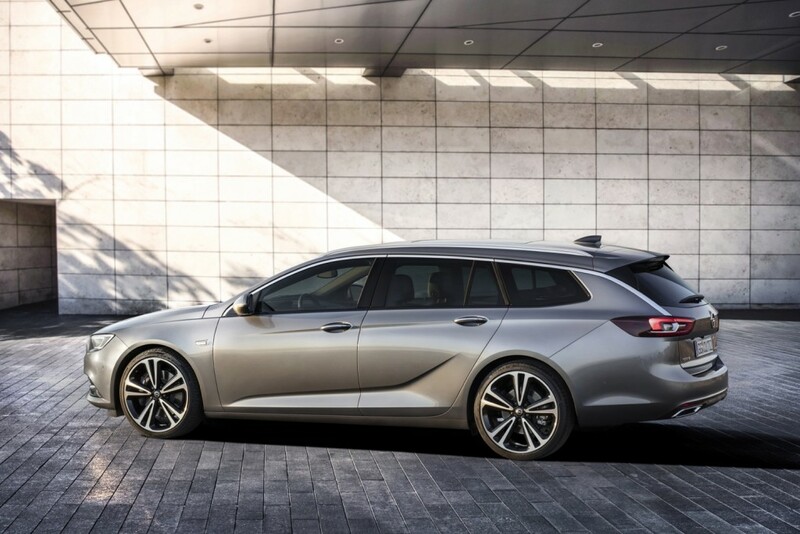 I am hoping that GM realizes that a Buick buyer, first and foremost, wants the sleek, upscale, sporty look with all the amenities of a Cadillac…That look is the Opel Insignia Sports Tourer…as the person stated above, Please give us the Insignia with a Buick emblem, and we will get in line now, with our Deposit. Previous comment regarding the Buick Regal, was mine 😋 Not Dennis Bs 🙈 It appears a typo sneaked in.